The Canon EF 14mm f/2.8L II USM Lens sports one of the widest focal lengths in Canon's L-series lens lineup. The 114º angle of view is ideal for vistas and interiors alike without the distorted quality of fisheye lenses. It can be paired with both full frame sensor cameras, such as the Canon 5D Mark III, and with crop frame sensor cameras, such as the Canon 7D Mark II. The focal length equivalent on crop frame sensors is 22.4, which is still very wide for most small space or landscape shooting applications. It features moisture and dust sealing for use in variable conditions and has near-silent AF. 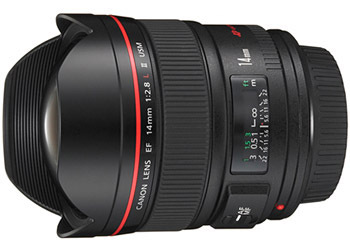 For a similarly performing lens with more range, we recommend the Canon 11-24mm f/4L. The Canon 14mm f/2.8L is ideal for low light shooting, thanks to its wide maximum aperture, and for landscapes, vistas, cityscapes, interiors, and real estate photography. • This lens is compatible with Canon EF mount cameras in both full frame and crop frame sensors. The focal length equivalent on crop frame sensors is 22.4mm. • This lens does not accept screw-on filters. There is a rear gelatin filter holder on the back of the lens (filters not included).